The legendary Royal Wing Suites and Spa officially held its Grand Re-opening celebration with a night of “Ultimacy” on Saturday, November 23. Following the complete make-over of the Royal Wing Suites and Spa, to celebrate this, a cocktail reception was held by the poolside of the Royal Wing. A sumptuous buffet spread accompanied by free-flowing drinks including award winning wines was served throughout the evening. A spectacular fireworks display and an excellent Jazz band made the night an enjoyable one for all. Vitanart Vathanakul proudly presents the Royal Wing Suites and Spa’s newly renovated features. Details of the history of the Royal Wing were given by Vitanart Vathanakul, the executive director of the Royal Cliff Hotels Group. 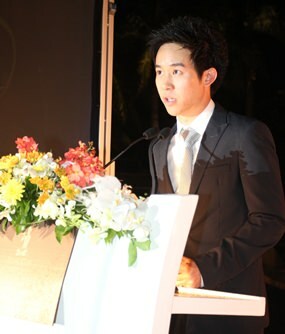 He addressed the guests saying that the grand re-opening celebration was a culmination of a long and fruitful process. Since its opening in 1986 by the Crown Prince of Thailand, the hotel has had a rich history of having renowned individuals from all over the world. It was closed down for two months this year to undergo a total makeover resulting in a sophisticated, new luxurious atmosphere while maintaining the core essence of the Royal Wing spirit: Ultimate Luxury. This transformation has paved the way for an array of new luxurious suites and conveniences intended to provide guests with the ultimate hotel experience. Royal Wing’s newly renovated features include an exclusive new entrance, which on the night of the re-opening had one Porsche, two Ferrari’s and a Lamborghini in executive parking! The upgraded suites are now furnished with Thai-inspired décor from its opulent bedroom extending beautifully to the lounge area and through to the luxurious marbled bathroom, which is equipped with a circular jacuzzi and a separate walk-in rain shower. The Presidential Suites have been redesigned into a 3-bedroom Presidential Heritage Suite and the 2-bedroom Presidential Platinum Suite. The Presidential Platinum Suite now features two bedrooms with breathtaking views and complementing generous living spaces adorned with wide windows to encourage enjoyment of the tropical surroundings. The spacious main bathroom now features a new jacuzzi bathtub located near the panoramic window to provide for relaxing baths and spectacular tropical sunsets. It now possesses a main living room with its stylish bar positioned as an important entertainment implement for guests and a home office space, tucked away amongst platinum luxury. These prestigious suites are accompanied with Presidential Salas that embody the essence of Thai-style beachside relaxation and luxury with its well-appointed interior and brand-new Jacuzzi. In addition to this, new innovation and technologies were also installed and all the suites now feature Internet Protocol Television system (IPTV) so guests can enjoy high definition television, huge movie and music selection and many more features. (l-r) Dr. Virachai Techavijit with his wife Thiphavan, H.E. M.R. Thepkamol Devakula, H.E. 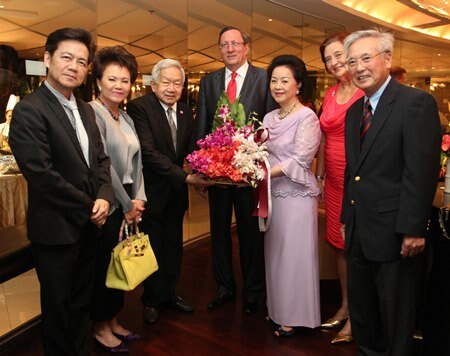 Alexander Mariyasov, Russian Ambassador to Thailand, Royal Cliff Hotels Group Managing Director Panga Vathanakul, Irina Mariyasova and Chan Vathanakul. The grand reopening was a breathtaking and glamorous event and signified the continuation of Royal Wing’s long lasting saga of exclusivity and ultimate luxury! Panga Vathanakul, the managing director of Royal Cliff Hotels Group, led the entire executive team in warmly welcoming the renowned guests who took part in celebrating another milestone for this world class all-suite hotel. (l-r) Nichawaline Baegaroonrung; Wiluck Lohtong, President, Siam Sport Syndicate; Vathanai Vathanakul, Vice-President of Royal Cliff Hotels Group; Vitanart Vathanakul, Executive Director of Royal Cliff Hotels Group; Voravudh Bhirombhakdi, Vice-Chairman of Cavallino Motors and Amarapat Julkasian Vathanakul. Distinguished guests who participated in this auspicious event held at the Royal Wing poolside included Privy Councilor, H.E. M.R. Thepkamol and M.L. Radeethep Devakula, Russian Ambassador to Thailand, H.E. Alexander Mariyasov and Irina Mariyasova, Former Advisor to the Thai Prime Minister and Founder and Chairman of the Regent’s Schools, Virachai Techavijit, Pramote Nonthapun, Vice-chairman of Ferrari dealer Cavallino Motors, Voravud Bhirombhakdi, Superstar actress & singer Pakkaramai Potranan, Economic Reporters Association’s President, Amornrat Charoonsmith, Chairman of the Board of Siam Sport Syndicate Public Co. Wiluck Lohtong and Melissa Horn, Managing Director of NK Auto Import Pitinun Kisadatanont and Pol. Maj. Thitisun Utthanaphol. For more information on the Royal Cliff Hotels Group and PEACH, please visit www.royalcliff.com and www.peachthailand.com. Superstar actresses & models Amarapat Julkasien, Pakkaramai Potranan and Nichawaline Baegaroonrung were as charming as ever.